Many people are stumped as to what to do with Swiss chard leaves: they use the leaves, and discard the stems. 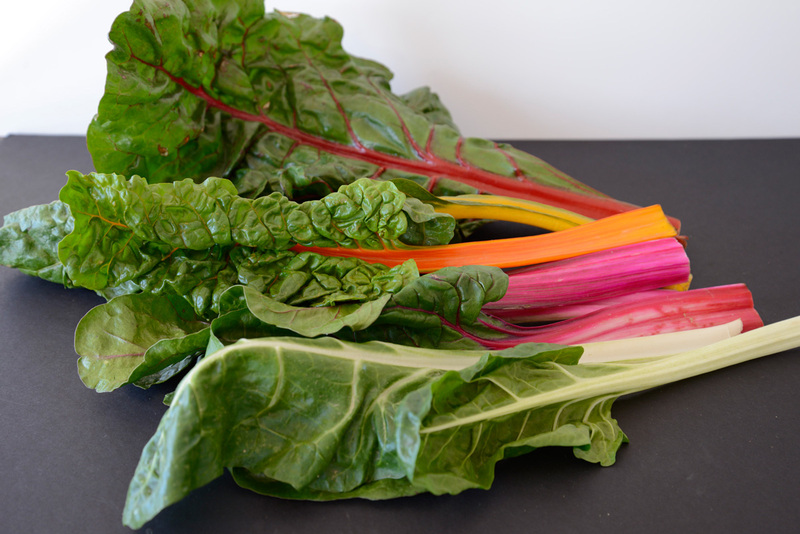 Swiss chard stems are delicious in salad, or even roasted. 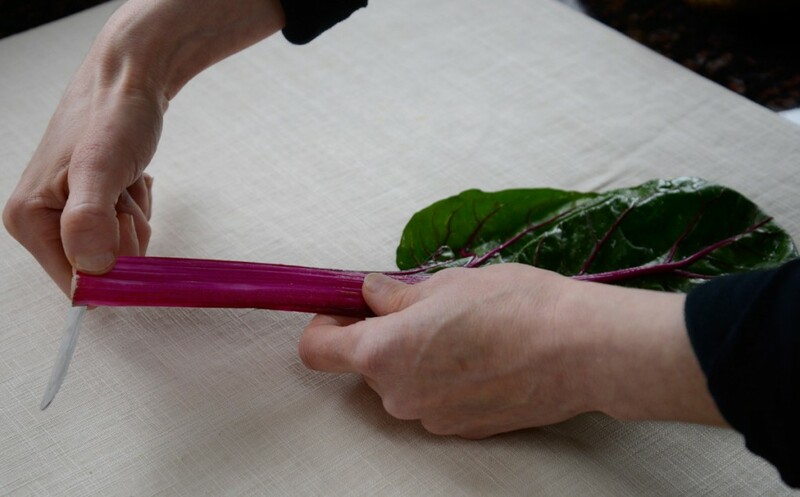 After trimming your Swiss chard stems (see below), wash well, chop coarsely, and cook for 5 minutes in boiling water before dressing with olive oil, lemon juice, salt, pepper, and slivered garlic; or boil as whole stems and roast under a layer of béchamel sauce and a dusting of Parmigiano at 350 degrees for about 20 minutes. 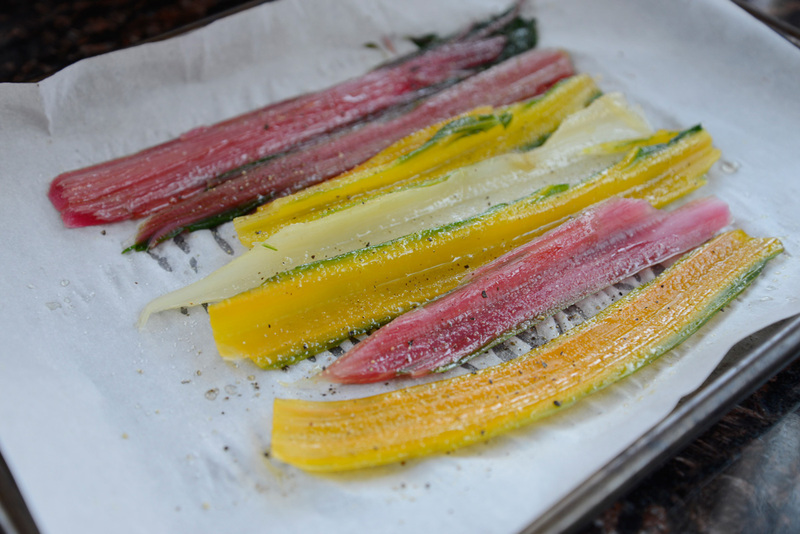 Or, simpler and healthier still, try the recipe below, for slow-roasted Swiss chard stems with just a dusting of Parmigiano. Check out our recipe for Pasta Gratin with Swiss Chard, Fontina, and Nutmeg to use up your Swiss chard leaves now that you’ve used the stems! 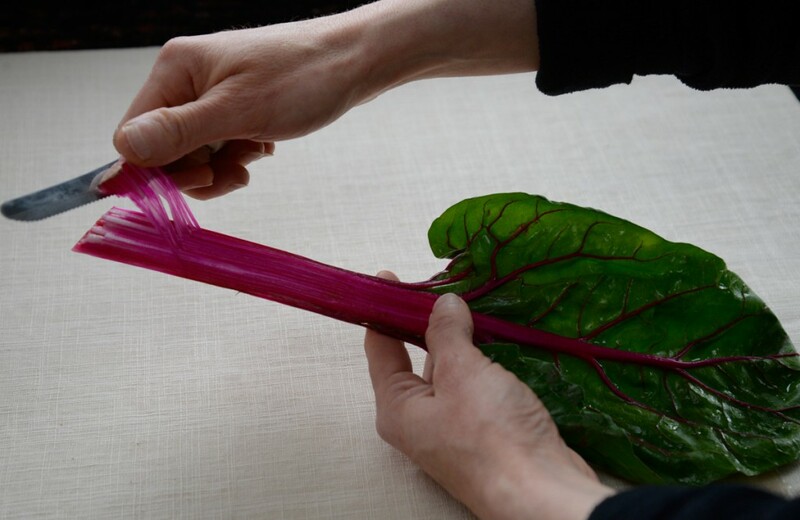 To prepare Swiss chard stems for cooking, wash well, then take a paring knife and cut off the bottom half-inch or so from each stem, and without releasing the knife, pull up to “peel” each stem, effectively removing a thin outer layer of fibrous strings. Bring 2 quarts of water to a boil. Add the stems and 1 teaspoon of the salt, and stir well. Cover and cook over medium heat for 3 minutes, or just until the stems are tender when pierced with a knife; they should not be falling apart. Drain and cool under running water. Blot dry on paper towels and arrange in a single layer on a baking sheet lined with parchment paper. Brush with the olive oil and season with the remaining 1/4 teaspoon of salt and the pepper. Dust with the Parmigiano. Lay another sheet of parchment paper over the stems and bake in the preheated oven for 25 minutes, or until the stems are golden and soft. 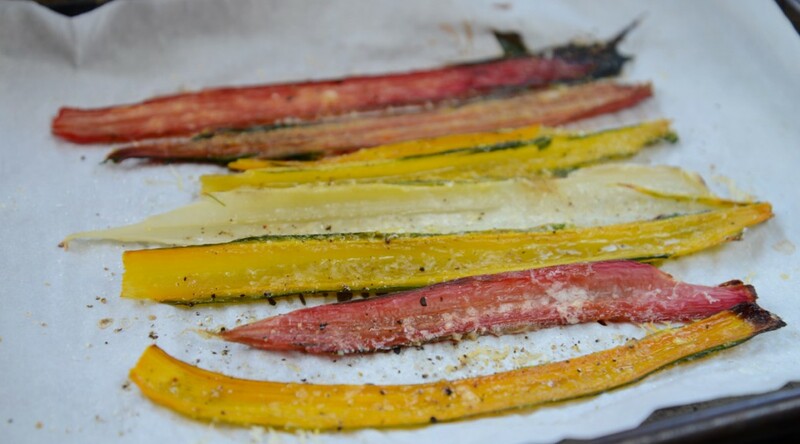 (If you do not have parchment paper, cover with aluminum foil; the stems need to be covered while roasting or they will dry out.) Serve hot, warm, or at room temperature.